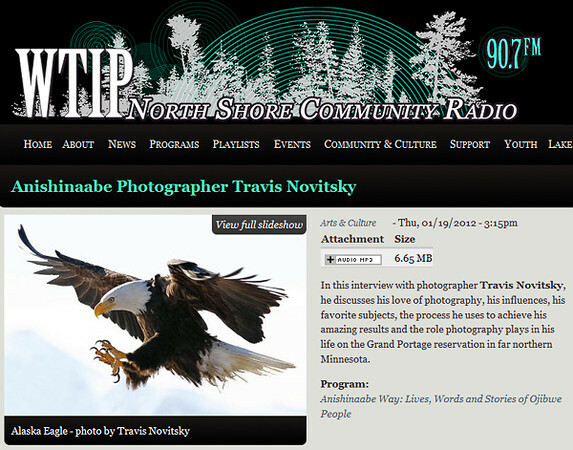 On Thursday, June 2nd I was live on the air in Grand Marais, MN with 3 friends and fellow photographers as part of WTIP's First Thursday Community Conversations program. Paul Sundberg, Tom Spence, Dave Brislance and myself got together to talk about cameras and our experiences photographing wildlife. In January of 2012 I was interviewed for the new program called "Anishinaabe Way - Lives, Words and Stories of Ojibwe People". The new program features the words and stories of many Ojibwe people including artists, poets, doctors, scientists, elders and children. 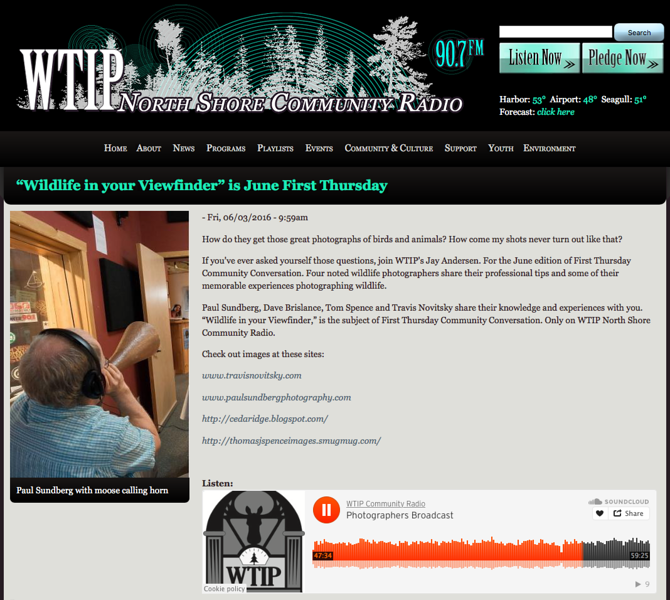 On August 12, 2011 I was interviewed live on the air as part of the "Roadhouse" program on WTIP. 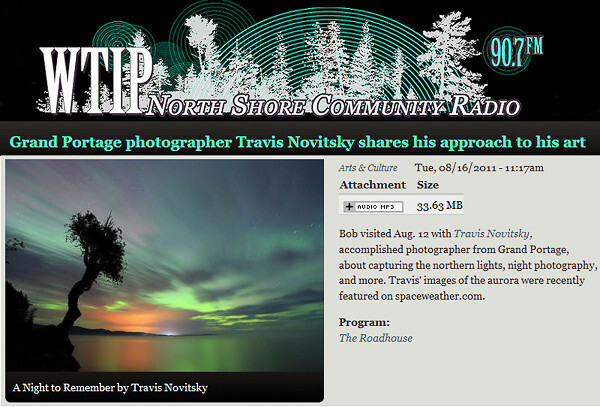 The interview is focused on the Northern Lights that I photographed on August 6, 2011 but we also discuss my general approach to photography. 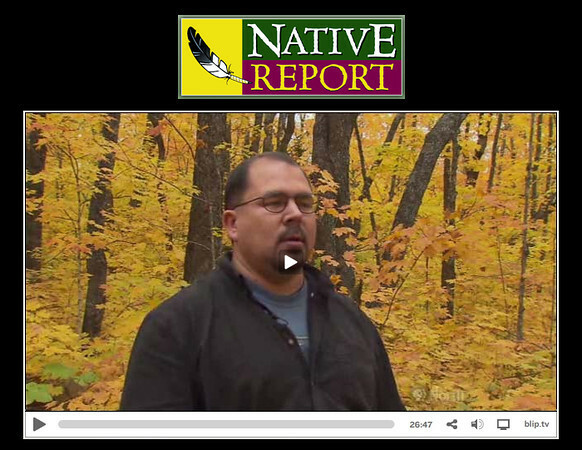 In the fall of 2010 I was interviewed by Michael LeGarde of Native Report for a feature that was aired on April 21, 2011. 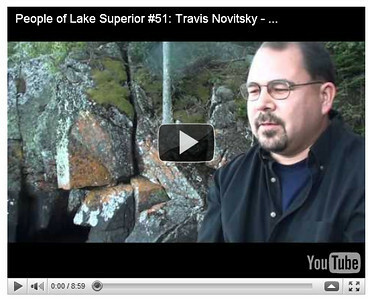 Informal video interview by Kate Crowley along the shores of Lake Superior in Grand Portage, MN. Kate and her husband Mike Link walked all the way around Lake Superior during the summer of 2010. As they passed through Grand Portage I met up with them for a brief visit and joined them for a short section of their walk. Feature article about my life and my photography in the November 28, 2007 edition of the Indian Country Today newspaper. GRAND PORTAGE, Minn. - For Travis Novitsky, there really is no place like home. Home, for him, is along one of the largest freshwater lakes in the world amid deep woods at the edge of Canada and the United States, surrounded by extended family. There, on the land of the Grand Portage Band of Lake Superior Chippewa, Novitsky knows instinctively the when and the where of how light will play on the land, trees and water. For a photographer, it's a very good place to be. What he knows and the skills that he has honed are earning him recognition for his photography. 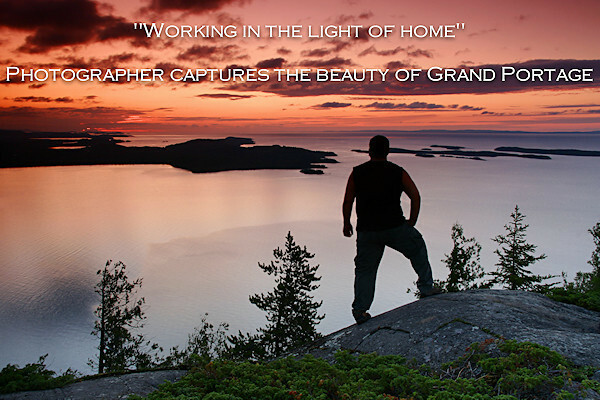 His photos have been published in regional magazines and are exhibited in the recently opened visitor center at the Grand Portage National Monument. He sells prints and calendars. In an online forum called Digital Image Cafe, he is among the top 10 photographers whose work most frequently wins the ''Photo of the Day'' contest. His Web site and blog are at http://www.travisnovitsky.com. Novitsky said that he, his cousins and friends amused themselves on the shores of Lake Superior while they were growing up. ''We spent 90 percent of our time outside bike riding, bumming on the beach, making sand castles, digging up clay or trying to catch fish with our hands in Portage Creek by making a corral out of rocks, leaving one side open, herding in fish. Novitsky's ''day job'' is working at Grand Portage State Park, the only state park in Minnesota not owned by the state - it's reservation land. 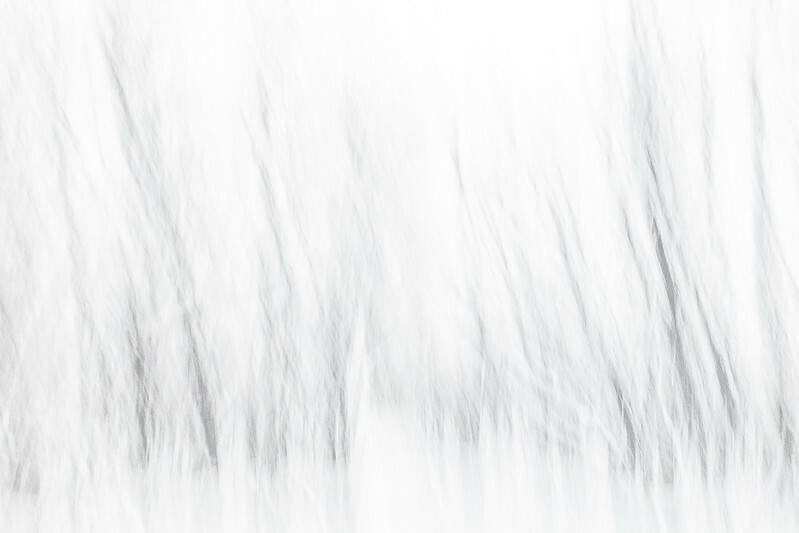 Rick Novitsky is also a published photographer. While he did not push the camera into Travis' hands, he frequently took him on excursions. Travis learned family values, too, from his mother, Rosie, who has six siblings including her eldest brother, Norman Deschampe, chairman of the Grand Portage Band. In 1987, Novitsky learned something new about photography when volunteers worked to raise the $85,000 necessary to buy one of the most sacred sites on the reservation, which was on privately owned land. The 300-year-old Manido Gizhigans, or Spirit Little Cedar Tree, grows virtually out of rock along the shore of the Great Lake. A photographer donated photos of the tree for a poster to help raise money. The band now owns the land around the tree so that it can be preserved for future generations. Today the band owns about 95 percent of the land on the reservation, thanks to earnings from its casino and lodging operations. About 300 of the 1,200 or so enrolled band members live on the reservation. Novitsky has become a visual keeper of that special site, shooting achingly beautiful images of the little cedar. As his work gains recognition, Novitsky finds himself in a new position as role model, just as others have been for him. With his digital camera, Novitsky has gone from desert to far Alaska. He's always glad, though, to return to the shores of Lake Superior. This sentiment does not surprise a man who spends his time framing that vast expanse.